Lovely irregular splotches of white and the fragrance of spicy roses on a large specimen sized scented geranium make Peacock Scented Geranium one of our garden favorites. Peacock Scented Geranium makes a great addition to our Zone 8-11 Fragrant Herb Garden Six Pack. Fragrant Ornamental This plant has been discontinued. 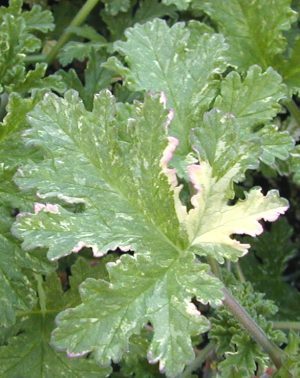 You might try Mint Rose Scented Geranium.